Melt butter in a saucepan. Saute celery and onion until translucent. In a separate pot, place 1 1/2 cups chicken stock, thyme, basil garlic and 1/4 teaspoon white pepper; simmer 15 minutes. Pour chicken stock mixture over the onions and celery; simmer 15 minutes. In a large mixing bowl, combine croutons, 1 whole diced apple, dried tarragon and parsley; add to stock mixture. Mix well. Spread mixture on a cookie sheet to cool. 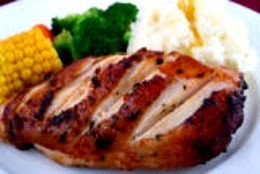 Place chicken breasts skin side down on a cutting board; flatten and score thick spots. Place a 3-inch ball of stuffing on the chicken breasts; roll the ends over the ball to cover it completely. Place each rolled up chicken breast on a cooling rack placed over a baking sheet. Pour a little water in the baking sheet. Bake chicken in a preheated 350 degree F oven for 18 to 20 minutes or until the chicken's internal temperature reaches 165 degrees F.
In a saucepan, combine 1/2 apple, 1/2 cup chicken stock, apple juice, brandy, whiskey, sugar, fresh tarragon, allspice, nutmeg and 1 pinch white pepper; simmer 20 minutes. If needed, thicken with a slurry of 1 Tbsp. cornstarch and a little water. This looks delicious! Just popping over from the Social Sunday party. I'm following you on Pinterest and GFC. Have a wonderful week! Good Morning Deanna, This is a lovely recipe. I have never cooked chicken using a baking rack with water in the baking pan below. I should imagine that cooking the chicken this way keeps the chicken moist and tender. I am certainly going to be trying this recipe as my husband will love the addition of Jack Daniels. Good Morning to you Daphne Bryson! aAnd thanks for your lovely comment, i do hope you and your family will enjoy this recipe. All I can think of to say is Wow, your Jack Daniels Whiskey Glazed Chicken is making my mouth water. I can't wait to try it.